So sorry for the lack of posts the last few days. I’m on vacation and I’ve been using the time to work on freelance projects and catch up with family. We just spent a few days out of town in New Paltz, NY. We walked around a glacier formed lake and looked at bright stars. We also visited with my parents who served us cupcakes, a dose of hospitality and grandparent babysitting so we could sneak away for a bit. We’re back in Brooklyn now, and catching up on projects while Henry goes to daycare. We’re also planning a couple of museum trips and lunch at a delicious ramen noodle restaurant in the East Village. 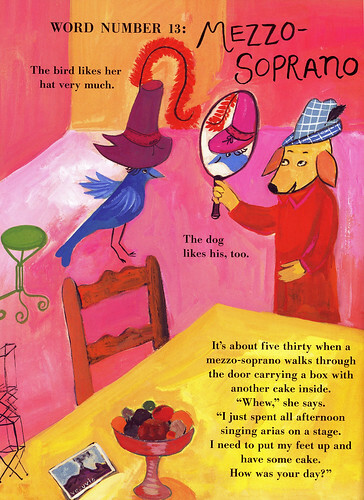 One show I don’t want to miss is the Maira Kalman exhibit at the Jewish Museum. Here’s a scan from one of her books, Lemony Snicket, 13 Words that I picked up for Henry.